DNA stands for deoxyribonucleic acid. It is a biological macromolecule called a nucleic acid, made of monomers called nucleotides. Nucleotides are the basic building blocks of nucleic acids. A DNA nucleotide consists of a phosphate bound to a pentose sugar, deoxyribose, bound to a nitrogenous base. The double helix shape of a DNA molecule is often compared to a spiral staircase or a twisted ladder. The backbones, or sides of the ladder are made of the phosphate and deoxyribose molecules of the nucleotides. The backbones are connected in the center by the nitrogenous bases. There are four nitrogenous bases that may be a part of a DNA nucleotide. They are Adenine(A), Thymine(T), Guanine(G), and Cytosine(C). Thymine and Cytosine are Pyrimidines. The have a single ring structure. Adenine and Guanine are Purines. They have a double ring structure. The four bases each join to a specific complementary base according to base pairing rules. Adenine always joins with Thymine, and Guanine always joins with Cytosine. (A-T, G-C) The bases are joined by Hydrogen bonds. Before cell division, the DNA is copied. This process is called DNA replication. The DNA double helix unzips when the enzyme Helicase breaks the hydrogen bonds between the nitrogenous bases. New nucleotides match with the old on each side according to base pairing rules, A-T, G-C. The enzyme DNA Polymerase bonds the new nucleotides together and proofreads the new strands, making sure that there are no errors. The process is semi-conservative. Each new double stranded molecule is composed of one old strand and one new one. The purpose of DNA is to control the activities of cells by making proteins. DNA is in the nucleus. Proteins are made at the ribosomes. Since DNA can't leave the nucleus, it requires an intermediate molecule called RNA. RNA stands for ribonucleic acid. There are four main structural differences between DNA and RNA. RNA is much smaller than DNA. RNA contains only a fragment of the information contained in the DNA. The sugar in DNA is deoxyribose, the sugar in RNA is ribose. Deoxyribose contains one less oxygen in its five-carbon sugar ring than ribose. DNA has the nitrogenous bases guanine, cytosine, adenine, and thymine, while RNA has the nitrogenous bases guanine, cytosine, adenine, and uracil. A triplet is three nitrogenous bases on the DNA sequence. A codon is three nitrogenous bases on the mRNA sequence. 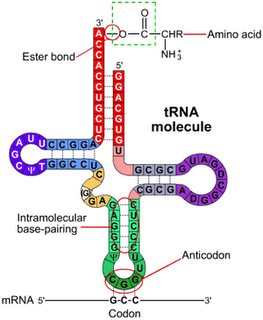 An anticodon is three nitrogenous bases on the tRNA sequence. The enzyme RNA polymerase binds to a promotor site on the DNA. RNA nucleotides match up to the DNA template. Once the termination site is reached, the RNA strand separates and the DNA strands completely rejoin. There are three types of RNA. mRNA, or messenger RNA, (shown above) carries the message from the DNA to the ribosomes where the protein will be made. It tells the order to bond the amino acids. 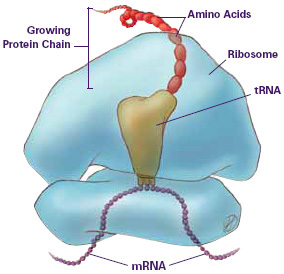 tRNA, or transfer RNA, (below, left) carries specific amino acids to the ribosomes to be joined to the protein polymer. 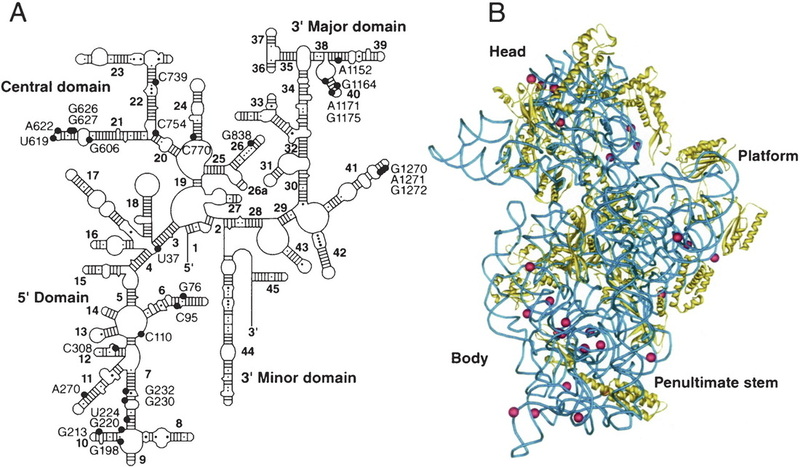 rRNA, or ribosomal RNA, (below, right) makes up a portion of the ribosomes. Ribosomes are about 50% rRNA and 50% proteins. Proteins are made at the ribosomes using mRNA as a template in a process called translation. Translation occurs in five steps. The mRNA leaves the nucleus and attaches to the ribosome at the start codon (AUG - methionine). The tRNAs pick up a specific amino acid from the cytoplasm and carry it to the ribosome. The tRNAs match their anticodons to the complementary codon on the mRNA. The amino acids bond together and the tRNAs break off to pick up another amino acid in the cytoplasm. Translation ends at a stop codon and the protein breaks away. Mutations are changes in the nucleotide-base sequence of a gene or DNA molecule. Knowing a few basic types of mutations can help you to understand why some mutations have major effects and some have no effect at all. A substitution mutation that exchanges one base for another (i.e. switching an A to a G, CTGGAG to CTGGGG). change a codon to one that encodes a different amino acid and cause a small change in the protein produced. change a codon to one that encodes the same amino acid and causes no change in the protein produced, called a silent mutation. change an amino acid-coding codon to a "stop" codon and cause an incomplete protein that likely wouldn't function. Insertions are mutations in which extra base pairs are inserted into a new place in the DNA (ex. CTGGAG to CTGGTGGAG). Deletions are mutations in which a section of DNA is lost, or deleted (ex. CTGGAG to CTAG). Since protein-coding DNA is divided into codons three bases long, insertions and deletions can alter a gene so that its message is no longer correctly parsed. These changes are called frameshifts. For example, consider the sentence, "The fat cat sat." Each word represents a codon. If we delete the first letter and parse the sentence the same way, it doesn't make sense. (hef atc ats at) In frameshifts, a similar error occurs at the DNA level, causing the codons to be parsed incorrectly. This usually generates proteins that are useless.